The co-op in Wall outside San Angelo is conveniently on the way to my place near Eden. The have bulk cottonseed for $230 / ton loaded in your own trailer. Dang near 1/2 the cost of protein pellets. 1. Overall opinion from folks who use for deer. 3. How long did it take deer to start eating? 4. Can you really just "leave it out"? We are 3,500 acres under a single high fence with no cross high fences...so basically just one big pasture so the deer have plenty of natural other stuff to eat. Starting our second year feeding cotton seed and our third year feeding L & E protein. 1.Our deer appeared to look very healthy this year. 2. If you have cattle on your lease you will need to keep your cotton seed feeders in pens because the cattle will eat it. 3. Our deer were eating it within a week of putting it out. To my knowledge their is nobody else feeding it close by so I believe it was a new food source. 4. Yes you just leave it out. I have an old trailer that I pick it up with from the mill and leave it sitting at the ranch with a shade cloth over it. It would be better if you could store it under cover but I don't have that option right now. 5. In my opinion its more cumbersome than dealing with bagged protein but something I'm willing to do right now. 6. I stopped feeding cotton seed in September and started back up Jan 1st. I put out roughly 2500 pounds last year as a trial run and they got on it quick and stayed on it every time I refilled. I have never fed it. What happens if it gets wet? Due to oils in cottonseed it is pretty moisture resistant. If it does get to wet it will grow, then the deer will eat the leaves on the cotton plants. Some people take a hog panel and bend it into a circle and shovel it full of cottonseed. I have seen the wire baskets used the most. Even seen some just shovel it into piles inside a feed pen. Interesting. Stuff is fairly cheap from what I've seen. I've seen a few folks say it can cause deer to be sterile, anyone have any experience with that? This is what has held me back from feeding it as well. Following to hear others responses. 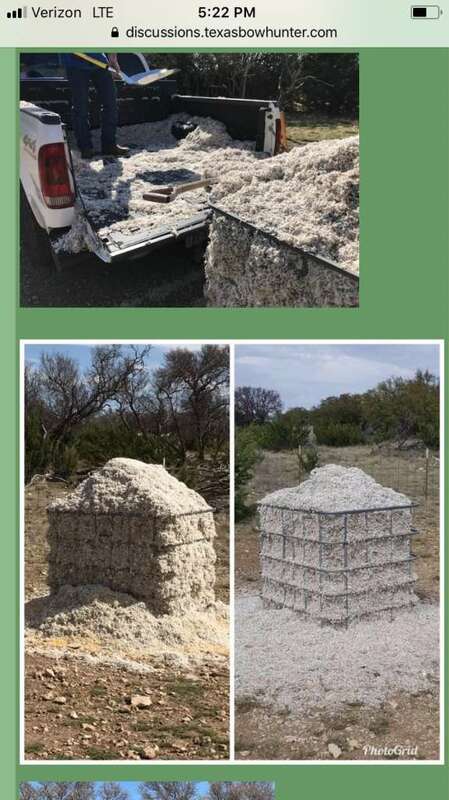 Has anyone used cottonseed in Northern Central TX. We hunt a place along the Trinity East of Corsicana and wondering about giving this a shot? We have never fed protein, just corn and fall food plots. It seems everyone is in STX that feeds it, didn't know if this is due to proximity to cotton gins or the fact that protein feeding deer goes hand in hand with big STX ranches. From the research I did several years ago on Cotton Seed and sterilization, this is all based on pen raised deer with no to very little native browse. Meaning Cotton Seed is there only food source. The sterilization is not permanent, it is caused by extreme levels of Gossypol in the system. So if you can stop feeding Cotton Seed just prior to deer shedding velvet you shouldn't have any issues with sterilization. If there is new research out there I wish someone would share. As stated previously I have only been feeding Cotton Seed for a year so my experience with it is not that extensive but I feel its a good addition to our management program. On a side note my brother shot a doe the last weekend of the extended season and it was pregnant with twins. We have a lot of rocky ground, actually caliche rocks. We have had truckloads of the trash hauled in from the gins. This includes the burrs, seed, cotton and weed seeds, and have let it sit there. The deer will pick through it and eat what they want. including some of the trash and the cotton seeds. Once it starts to decompose, it gets plowed in with teh dirt and rocks. . Combat Infantryman, the ultimate hunter where the prey shoots back. do hogs like cotton seed? "everyone that lives dies but not everyone who dies lived..."
They will eat it if they are extremely hungry. If they can get to it and don't eat it, they will root the pile or wire basket up and scatter the WCS all over the place. no it will not cause sterility if fed on Lf ranch or larger Hf ranches. If fed to penned in deer it could have issues . We have fed it for years with great results. It is most effective post rut - January to September. Hogs do not bother ours much. We have no cows so we put the wire feeders out all over our ranch so that fawns can utilize it - fawns cannot jump our pen panels to get to protein so this is a way to get the young deer some nutrition especially in drought years. Last edited by tlk; 01/29/19 12:51 AM. thanks ... been trying to figure out a cost effective way to introduce higher protein into our east Texas lease (Fairfield) since the majority of the other hunters are a bunch of tight wads and usually go out opening weekend of MLD3 season to work/fill their feeders. ZK-315 & I have a couple of more remote spots that could be a good location to introduce something, one feeder has a good pen, another feeder has a sketchy pen but big hogs still get in and the third feeder is a hog magnet without any pen. A friend built up cotton seed feeders out of cattle panels and buys his CS in bulk, but has them inside pens. maybe I'll give a couple a shot to see how they go. Anyone have any experience with cotton seed and exotics? Ive been doing a good bit of reading. Seems like axis, aoudad (sheep in general) love the stuff. Also read about someone starting to feed it and their entire fallow herd killed over. Reason for all the questions is, I have a small HF place South of Ozona with a few different exotics as well as whitetail on it. Just trying to decide if I want to dive off into it to knock down my feed bill some or just keep on doing what I'm doing. Got a couple of the water tote cages set up with cottonseed from the Wall co-op in them as of 2/1/19. Put 900#s in each. I'm interested to see how long it takes them to start eating. Also, another tid-bit of information...the co-op said they will likely run out by the end of March...so, I'm going to have to stockpile some on my place to keep it going. 10 days later they haven't touched it yet. I'm still sprinkling it with corn / pellets...but no takers yet. Give it time. Takes them a bit to figure out it's edible. Well...23 days later and they still aren't eating it. But, they are also just barely hitting the protein pellets...weird. NRCS agent was out at our place and said we are loaded with natural high protein browse as a result of all the rain and mild winter. Explains why they haven't been hitting any supplemental feed. Just about any ruminant ("four chambered stomach") will relish cottonseed when other high-protein food is not available (and often even when it is). The presence of good quantities of food like acorns or certain forbs and herbs will greatly slow the utilization of any kind of supplemental feed, but that doesn't mean that the feed is "no good". And I'll assure you that you don't have enough money, time, or labor to feed enough cottonseed to damage deer (or exotics) in any way. Horses might be a different story, but they get sick and die just to mess with you. A little lite reading material. 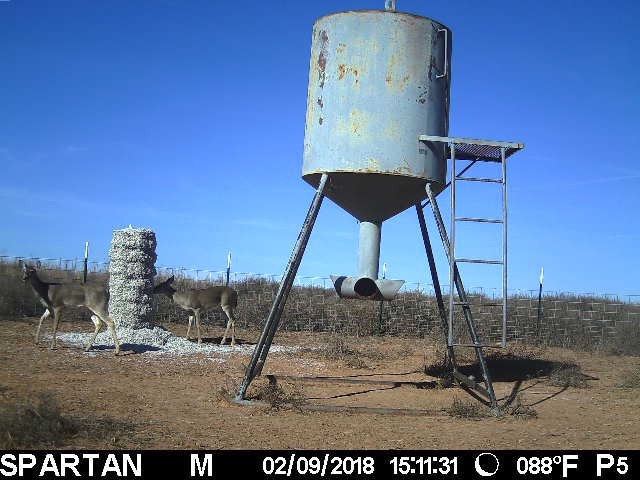 I was dead set against feeding WCS when I first started feeding, but as more research came available and I actually saw whitetails eating it free choice from the supply one of the ranchers used for his sheep (Val Verde County) I changed my mind. However, the rancher feeding the sheep only fed WCS during the 3 months of winter to the sheep. Did that impact on deer? No idea, but I saw nothing to indicate that it was bad for them during the time the rancher fed WCS to the sheep. 12, 000 acre ranch, with 6 pastures. Take it for what it's worth to you. I just finished writing an article about how I like to feed both protein and cottonseed but don't forget minerals. Especially if you are feeding cottonseed - it is pretty much devoid of all mineral content. I've got a bit of a breakdown in here as well about the nutritional needs of whitetail.